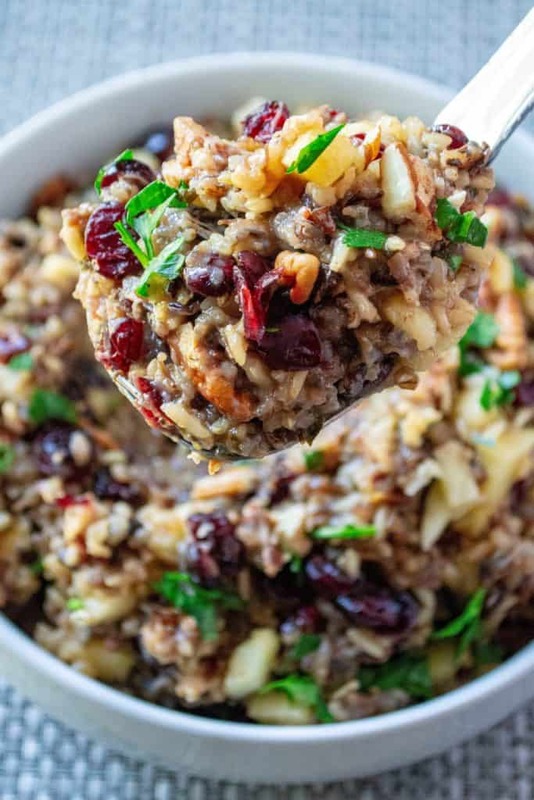 Slow Cooker Cranberry Apple Pecan Wild Rice Pilaf is wild rice slow cooked in apple cider and chicken stock then topped with tart cranberries, sweet apples and crunchy pecans to serve up the perfect slow cooker holiday side dish. 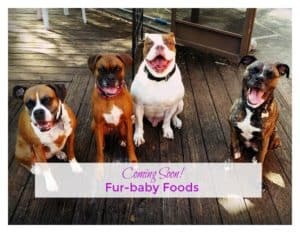 Let’s talk a minute about some heavy duty eating opportunities, specifically what many of us refer to as “the holidays”. Now, while we all promise to try to keep our portions socially appropriate and our binge eating to a low roar, often times we completely fail at both and next thing you know we are power slamming raw Christmas cookie dough straight into our face when we are supposed to be making Christmas cookies and not even feel bad about it… not even a little bit. 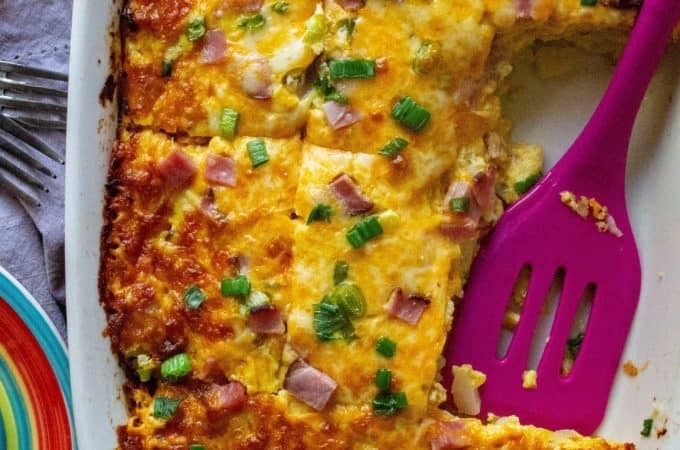 So instead of losing all touch with the reality of holiday food, we don’t we try to add in at least one recipe that is super easy, way tasty and won’t bring about head hanging shame if you go back for seconds. 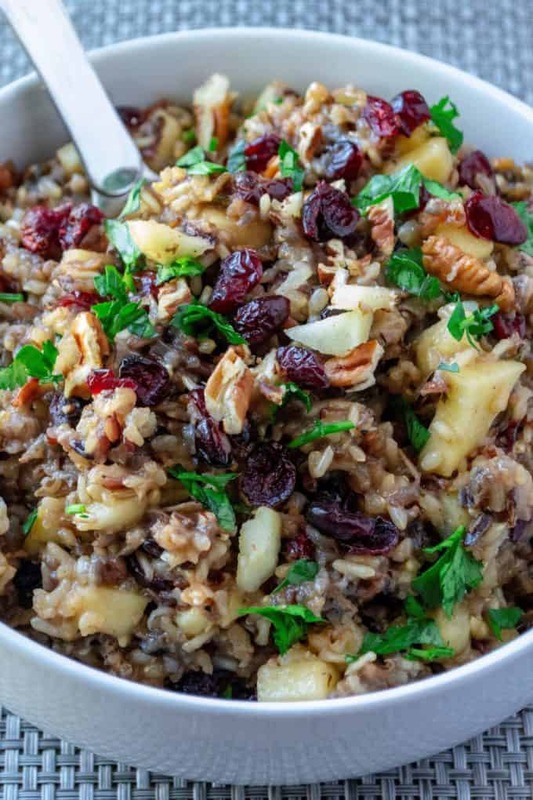 Yup, let’s talk about this Slow Cooker Cranberry Apple Pecan Wild Rice Pilaf. Oh no … those are carbs!! Stop. 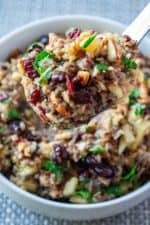 Slow Cooker Cranberry Apple Pecan Wild Rice Pilaf is delicious and the perfect combination of sweet, tart and crunchy and since you are just dumping it all in a slow cooker and walking away, this is honestly the perfect easy holiday side dish. 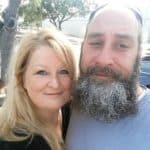 Start you keto again tomorrow, it’s all going to be okay. Here’s a kicker, wild rice is not actually rice. It’s a hearty grain related to rice but it’s not rice as we know it. 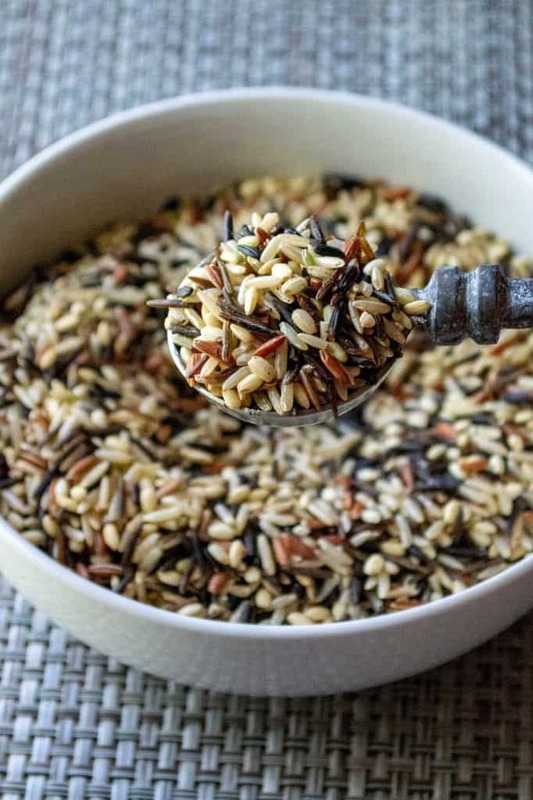 Wild rice has a toasty, nutty flavor and is most often found in packages of wild rice blends. 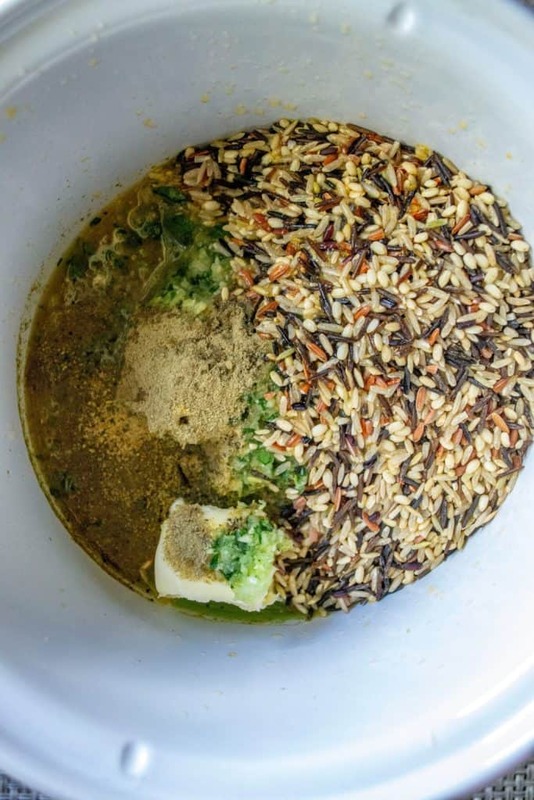 I used Lundberg Wild Blend Rice for this recipe and it was easily found pre-packaged in the rice / pasta aisle of my grocery store. The wild rice blend is just that, a blending of different types of rice including long grain brown rice, wild rice, sweet brown rice and a few others. Traditionally speaking, pilaf is a Middle Eastern dish in which rice is cooked in a seasoned broth. Then meat or vegetable is added to it. 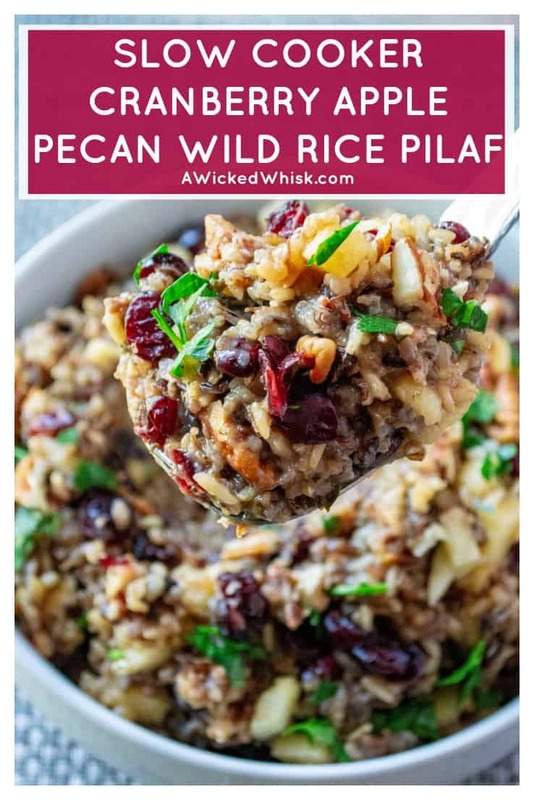 For this wild rice pilaf recipe, I left out a meat source but this Slow Cooker Cranberry Apple Pecan Wild Rice Pilaf would be perfect to add roasted chicken to if you wanted to flip it from a slow cooker side dish to a main course meal. 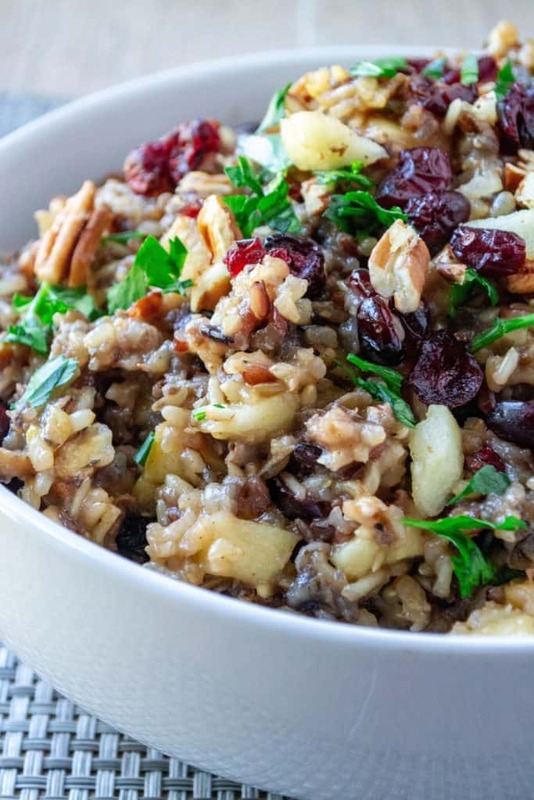 HOW DO YOU MAKE SLOW COOKER CRANBERRY APPLE PECAN WILD RICE PILAF? Hang on, this one is a fast one. 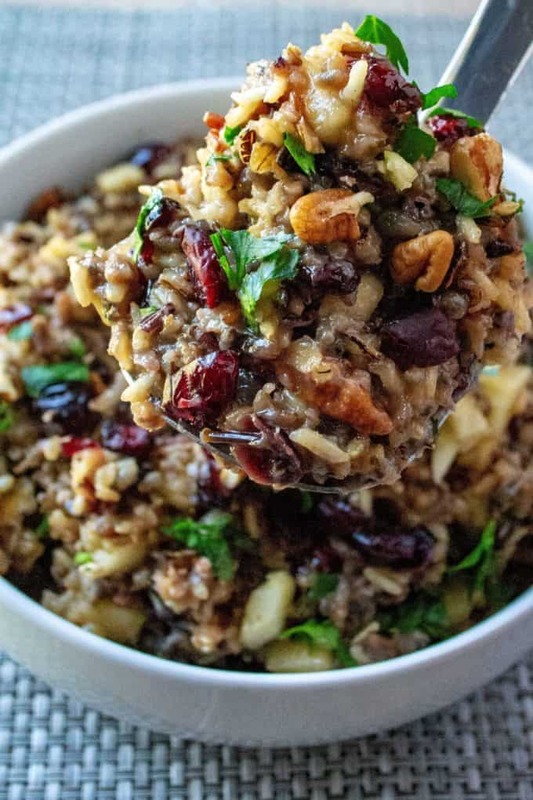 To make your Slow Cooker Cranberry Apple Pecan Wild Rice Pilaf, add your garlic, onion and parsley to a small food processor and pulse until everything has been diced. Add this to your slow cooker. Then add in the butter, wild rice blend, chicken stock, apple cider, juice and zest of one orange and your seasonings. 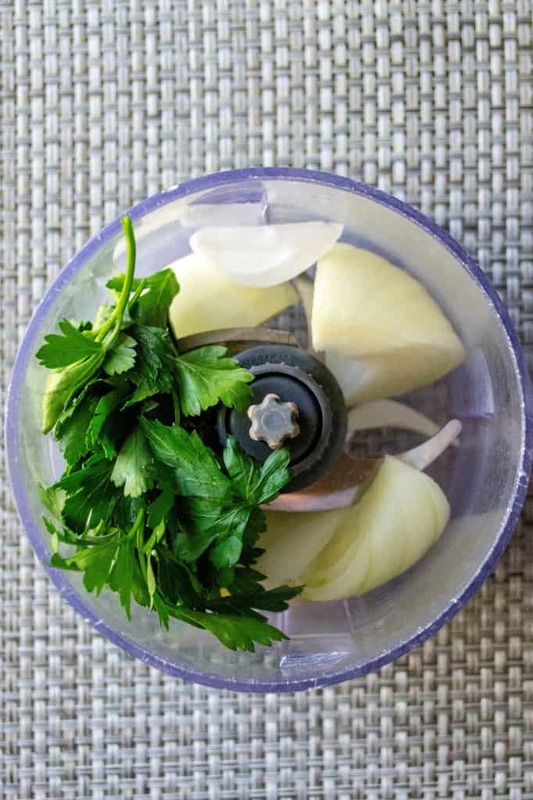 Give a quick stir and set your slow cooker to cook on Low for 4 – 5 hours. When your rice is cooked, add pecans to a small pan and roast over medium high heat for 3 – 5 minutes, stirring often to avoid burning. When your pecans have toasted and they are fragrant, add them along with your cranberries, chopped apples and the maple syrup to the rice in the slow cooker and stir well. Let cook for another 5 – 10 minutes and then serve. Let’s just all take a moment to thank the inventors of the slow cooker as we know it. 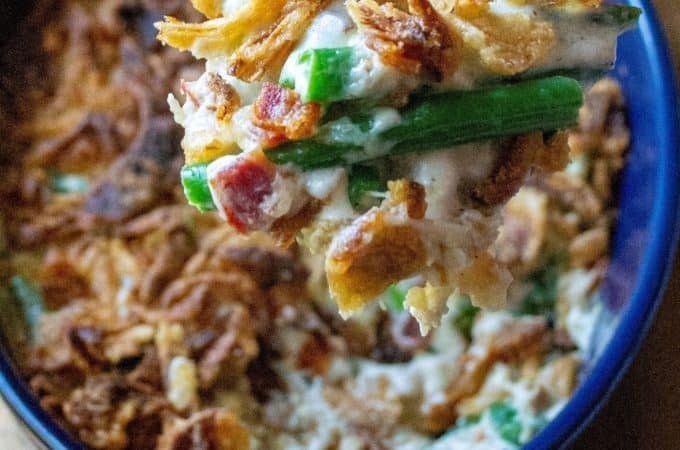 Entertaining and holiday get togethers just got a whole lot less stressful by adding this easy holiday side dish to your dinner line up. 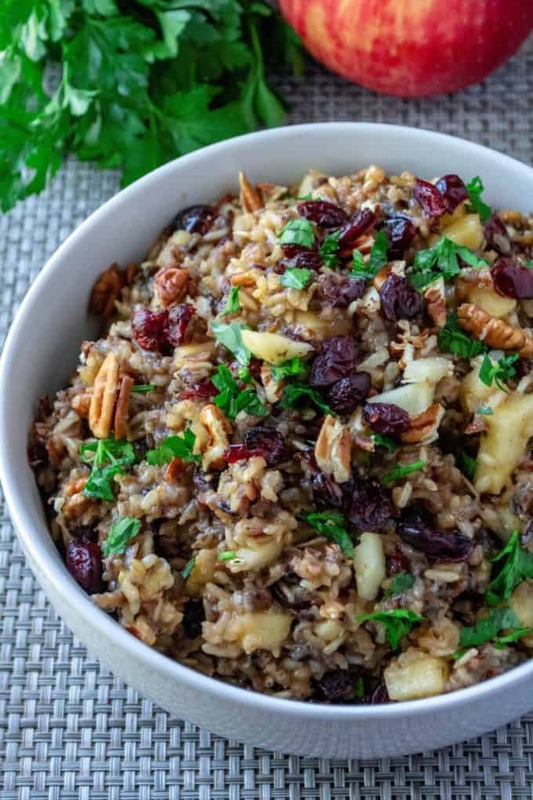 Slow Cooker Cranberry Apple Pecan Wild Rice Pilaf is the easiest and tastiest dish you will be serving up this year and trust me, this wild rice pilaf is not just the holidays. This is such a family favorite side dish that it get served up year round in my house. You are going to be tempted to keep checking on your rice to see if it’s cooking. Stop! Let the slow cooker do it’s job 🙂 Stir it once around the 3 hour mark but other than that, let it be. Watch your pecans closely when you are toasting them. They burn fast so make sure you are stirring them often and as soon as you can smell them cooking, they are done. Not a fan of cranberries? Try substituting golding raisins or even dried apricots in this dish… either would be lovely. 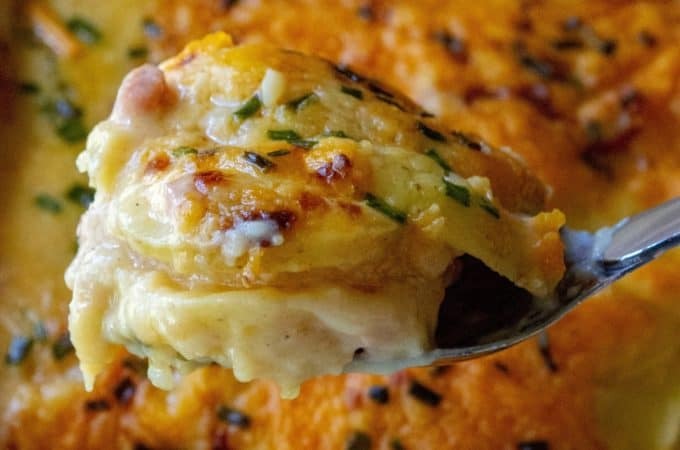 Looking for more easy side dish recipes to share with your family and friends? Check a few of my favorite side dish recipes below. Crock-Pot SCV700SS Stainless Steel 7-Quart Oval Manual Slow Cooker, 7 Quart – A Must Have in any kitchen! Ninja Food Chopper Express Chop with 200-Watt, 16-Ounce Bowl for Mincing, Chopping, Grinding, Blending and Meal Prep (NJ110GR) – the one kitchen appliance I can’t live without! IF YOU’VE MADE THIS, PLEASE GIVE IT A STAR RATING BELOW! To make your Slow Cooker Cranberry Apple Pecan Wild Rice Pilaf, add your garlic, onion and parsley to a small food processor and pulse until everything has been diced. Add this to your slow cooker. Then add in the butter, wild rice blend, chicken stock, apple cider, juice and zest of one orange and your seasonings. Give a quick stir and set your slow cooker to cook on Low for 4 - 5 hours. When your rice is cooked, add pecans to a small pan and roast over medium high heat for 3 - 5 minutes, stirring often to avoid burning. When your pecans have toasted and they are fragrant, add them along with your cranberries, chopped apples and the maple syrup to the rice in the slow cooker and stir well. Let cook for another 5 - 10 minutes and then serve.